Author Starbright Floral Design of NYCPosted on April 16, 2015 Categories All About Starbright, Flowers as Gifts, Flowers for Business, Seasons, Thoughts and IdeasTags Administrative Professionals Day, floral design, Floral Desing, florist, Flower Design, flowers in Manhattan, flowers in new york city, Secretaries Day, sending flowers, starbright floralLeave a comment on Secretaries Day Flowers: The law of unintended consequences strikes again! Echinacea is part of the daisy family. This flower is unique to the areas of eastern and central North America, where you can find it growing in large numbers in open wooded areas and prairies. Echinacea comes from the Greek word “echino,” meaning sea urchin, and the flower is certainly reminiscent of this spiny creature. 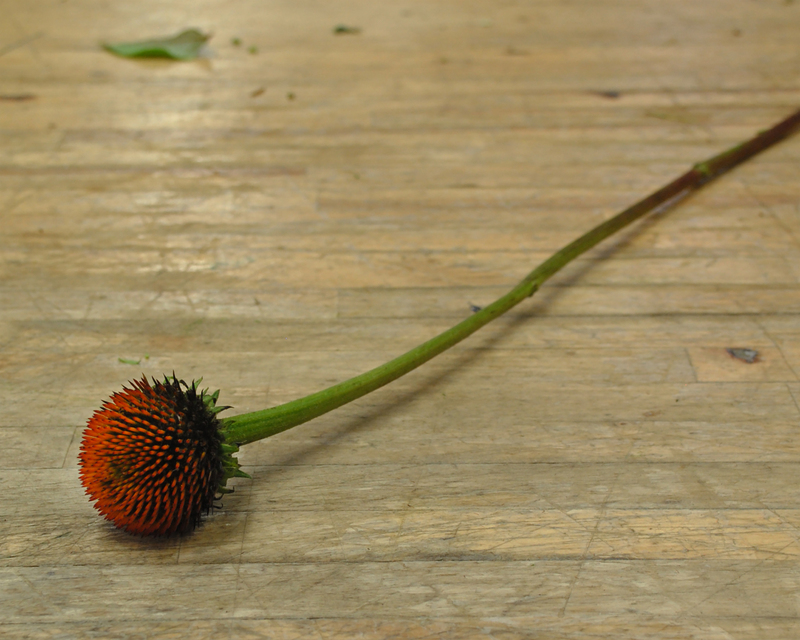 The center of the flower is a spiky, cone-shaped disk, which leads its other nickname: the coneflower. The purple petals that surround the spiky center are removed before the flower is sold, because the petals are very delicate and bruise easily. Their absence makes the sea urchin-like center of this flower all the more striking. Echinacea has been used in folk medicine for centuries. Native Americans originally observed this flower being eaten by elks that were sick or wounded. They adopted the flower for their own use in medicinal practices, and called it elk root. It was used to treat a variety of ailments, including sore throats, headaches, and the common cold. Native Americans passed on their knowledge of echinacea to Europeans, and the plant became popular in European medicine in the 1930’s. Feeling under the weather? Echinacea is still used today to boost the immune system. It’s great as a tea, but don’t try to boil anything from an arrangement – these guys have been drinking flower food which makes them unsafe as human food. Echinacea is a great choice if you’re looking for an ornamental or decorative flowers, thanks to its unique appearance. You can find it in bloom from early to late summer. The cone will dry exactly as it looks and is great for decorating.